Perfect course after 10th standard. Even more perfect for students looking for a course after 12th standard or graduation to make a career. You can start your first job in 6 Months. Working professionals can upgrade their skills to gain better job opportunities. Caba also provides its students to earn while you learn. 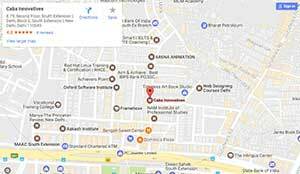 Caba Innovatives is a pioneer institute in Multimedia Animation Courses in Delhi since 1993 and has trained more than thousands of students who are well established in the graphic design industry. Caba is the only institute that provides 100% Job Guarantee Course or Money Back. Classes are held at Caba’s state-of-the-art classroom and production training facilities in South Extension, Part1, New Delhi, which provides students with easy access to the Institute. Classroom instruction is delivered by experienced faculty with many years of industry experience. Some of our faculty members are practicing professionals from within the industry and provide hands-on exposure to the latest technologies and industry trends. Caba Innovatives Multimedia Institute is one of India’s first multimedia training and certification institutes. It has been serving the industry since 1993. Our 12 month PG diploma program is an industry-recognized qualification and our most popular course with hundreds of graduates serving all industry segments and verticals including print, broadcast and digital media, software and production houses. When you graduate from one of our diploma programs, chances are high that there is a Caba graduate and alumni waiting to conduct a job interview with you on behalf of the employer. The course content which we have expertly researched and included in our curriculum is not only specific and relevant but also responsive to industry needs. As the job market continues to become more demanding and competitive, It has become necessary to acquire advanced-level working knowledge of all the various aspects and focus areas within multimedia so that you can qualify for jobs that require you to multi-task and perform different functions within multimedia. Please call us or use our handy contact form to get in touch with us for more information. Enrollment is currently open for the 2014-15 academic year so please get in touch with Caba at your earliest convenience for exciting careers in multimedia. Our introductory course in computers and multimedia is designed to provide you with an overview of computer fundamentals. No prior knowledge of computer hardware and software is assumed. The course covers important computer operations such as starting and shutting down the system, launching, installing and uninstalling applications, system backup, multi-tasking and general system maintenance. You will also gain an in-depth understanding of the Windows XP operating system with specific reference to multimedia applications. The course offers comprehensive training in tool technologies that are critical to a successful career in multimedia. Knowledge of graphics and graphics tools will provide you with a plethora of creative possibilities to showcase your abilities and potential as a graphic artist. Visual elements such as line art, photographs, drawings, graphs used in spreadsheets and images used in CD-ROMs help students in visualizing and conceptualizing illustrated image projections on digital formats. The software packages you will learn during this semester will help you to develop a clear understanding of design concepts and application, texture, design and image editing. In addition to tools training, the course provides a holistic introduction to graphics theory and applications to boost your independent creativity. Learn how to use line art and effects when crafting digital art. Graphics is the backbone to animation, web and video in addition to all multimedia disciplines. The course provides a blended approach to both theory and practice to prepare you for exciting careers in digital multimedia designing. Your final creative outputs will also include brochures, media kits, sales and marketing collateral, full length books and much more. In short, you will be all set to embark on the path to becoming a seasoned print industry professional. The primary focus of the course is to prepare you for careers in print media including the newspaper, magazine and book publishing industries. The international quality of training and instruction we deliver in this course also prepares you for career opportunities in the highly lucrative and well-paying book publishing BPO sector in India. The course teaches you how to create a new dimension to reality through digital sound and special effects in which your imagination and creativity know no bounds. It prepares you for robust and lucrative careers in post production and sound editing with major industry segments such as broadcast television, ad film making, motion pictures, digital audio recording, audio publishing, media houses and many other related industries where demand for industry professionals is on the rise constantly. The course also serves as a launching pad in which the instruction and training you have received in semesters 3 and semester 4 in graphics and animation merge with digital audio production and editing to provide you with a well rounded skills set to independently apply your knowledge to live projects in real time. Learn how to title and sub-title video footage as well as how to create and trigger flame effects. We will also teach you how to eliminate rough shots and merge all the various elements and components of digital multimedia into a cohesive whole. The news channels are currently using these knowledge assets in a big way today thus adding to your marketability and career potential. Students enrolled in professional courses are typically evaluated during job interviews on the basis of their portfolio and project work. With a view to recognizing this key element in the pedagogical process, Caba has constituted a fully functional internship program in which students receive direct industry exposure by working as an intern. We help you organize both your online and offline live projects into an impressive portfolio. The end-semester project is your platform to showcase and even show off all the cutting-edge training you have received from Caba in a controlled and instructor-led environment. Q1. Who Should do this course? Q2. What is the outcome of the course? A. You will be employed with web design, web hosting, web media companies and more importantly with many MNC’s due to the rising web portfolio, product know-how in higher demand on web rather than any other media. Q3. What is the future scope of Web Designing? A. With rising of internet users in millions by the day, web is more popular than any other media. From Computers to tabs to mobile phones, everyone can be seen using web on daily basis not only for social but as well for business enhancements. The industry growth is very strong and is to remain for much more years as the spread of internet now may not stop. Q4. Is this course enough to settle a good career? A. Yes, this is the most rewarding career today compared to any other technical field. For future enhancements it is strongly recommended that video and animation must be learnt as well. More and more users of web need animation and videos to understand or buy products online with virtual enhancements.